Kathy Tseng, a Taiwanese-Costa Rican businesswoman, was absolved Monday in a Puntarenas court on charges of illegally landing 652 shark fins on a Costa Rican dock in 2011. According to prosecutors and ocean conservation groups, the landmark ruling by a Puntarenas judge has opened multiple loopholes for finners looking to skirt the law. Since 2005, Costa Rica has had some form of ban on shark finning, a fishing method popularized due to the disproportionate rise in the value of shark fins – the key ingredient in the Asian delicacy shark-fin soup – when compared to shark meat. To maximize profits by saving room in their hulls, fishermen began slicing off sharks’ fins and dumping the still-breathing animals overboard to bleed-out or be eaten. Finning has had no small part in the huge declines in Pacific shark populations. Biologists say that more than 90 percent of the populations of some shark species have been wiped out in the last 15 years. Tseng’s case involved the first-ever prosecuted use of a technique known as “spining,” where shark spines are kept intact with the fins attached by strips of skin and the remaining flesh cut away. The slice-and-dice finning method was devised to slip through a loophole in Costa Rican law, which requires fins to arrive “naturally attached” to the sharks’ bodies. In September 2011, Tseng’s boat, the Wang Jia Men 89, docked in the central Pacific port town of Puntarenas with 332 shark skeletons. Before the boat docked, Tseng sent an inquiry to the Costa Rican Fisheries Institute (Incopesca) to ask what would happen if her ship landed with spined sharks. She claimed the shark meat had been used for bait and as food for the crew. 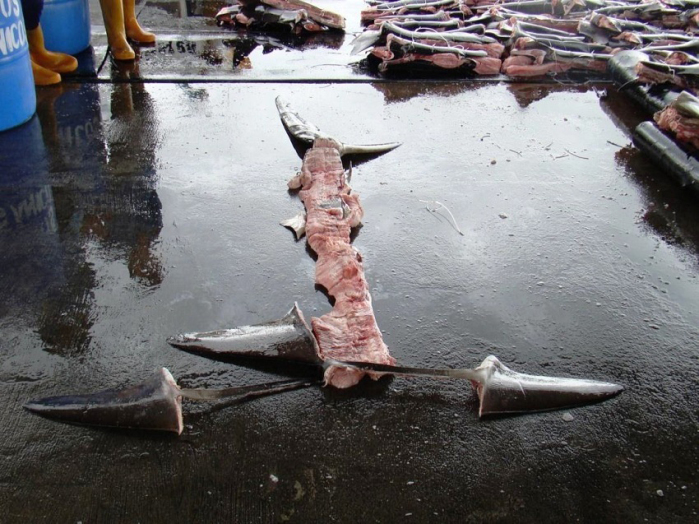 Luis Dobles, Incopesca’s executive director, allowed the boat to dock and unload the rest of its product, but a local prosecutor ordered customs officials to destroy the shark spines with fins. The prosecutor’s office opened investigations of both Dobles and Tseng, who in 2010 also was accused along with two others of human trafficking after authorities discovered 36 Asian slaves working at the group’s fishing company. Dobles’ case is still under investigation and may not go to trial. There have been no further reported incidents of shark spining since the Wang Jia Men 89, but in November, Interpol issued a purple alert warning other countries to be on the lookout for spining. In the weeks leading up to the ruling, ocean conservation groups published press releases warning that a not-guilty verdict could set a bad precedent for finning in the future. According to the case’s prosecutor, Tatiana Chaves, Judge Franklin Lara absolved Tseng of all charges, saying she had not broken the law. The judge ruled that because Tseng did not unload and sell the finned sharks, she had not committed a crime. However, during the trial, both defense expert witnesses backed out of testifying. Incopesca biologist José Miguel Carvajal chose not to testify after the prosecution warned him that taking the stand could endanger his job at Incopesca due to a conflict of interest. Environmental consultant Moíses Mug failed to show up in court. The Tico Times has reached out to the defense’s lawyers and is awaiting comment. The judge involved in the case cannot comment until after the sentencing date. 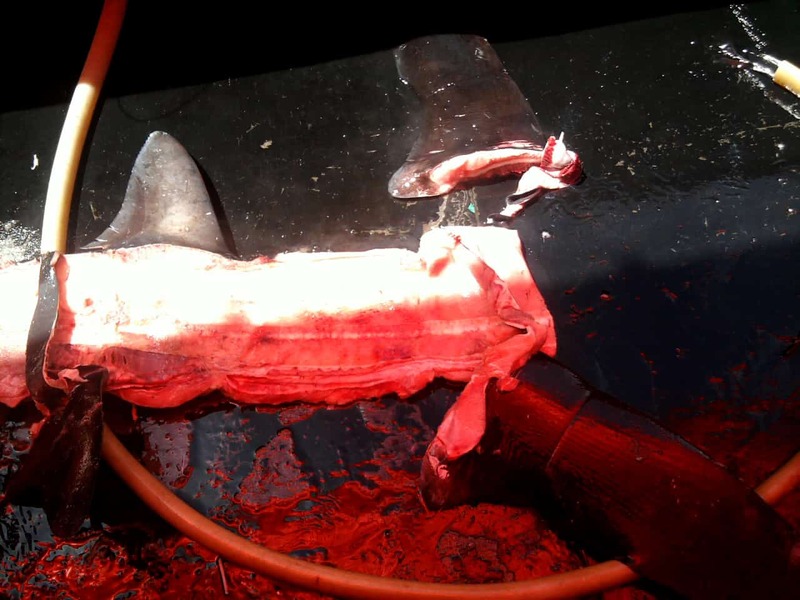 Prosecutors and ocean conservation groups fear that Monday’s ruling will effectively allow shark finning to continue unsanctioned, and, according to Chaves, the implications extend beyond spining, affecting finning legislation in general. Chaves told The Tico Times the judge’s reasoning also calls into question finning operations at sea, such as last week’s seizure of more than 150 fins from a Costa Rican boat in the country’s South Pacific. If the fins must be landed for a crime to have been committed, then fishermen caught in the act of finning may not be culpable. According to environmental groups, the verdict weakens the strong stance Costa Rica has recently taken on marine conservation, a position that won President Laura Chinchilla the Shark Guardian Award from international shark conservation group Sharkproject. Though Tseng was absolved of finning, prosecutors can still appeal the decision within 15 days of the ruling.